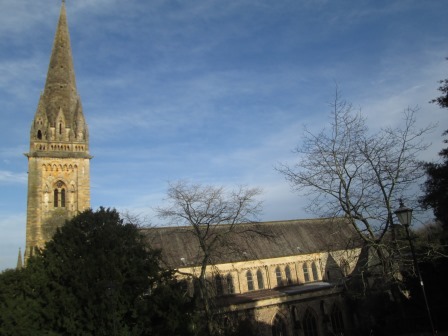 At Christmas we visited Annabelle’s mother, who lives near Llandaff Cathedral in Cardiff. Cardiff can be quite a shock for us country girls. No wide open spaces, no peace and quiet, just a lot of concrete and noise – cars racing up and down, people shouting into phones, kids bouncing footballs on the pavement. 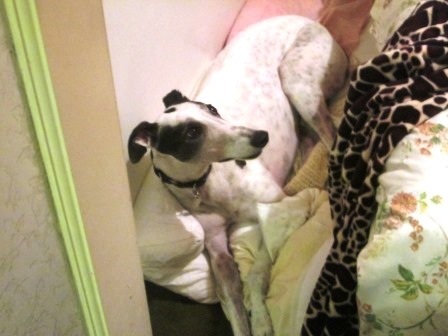 Pearl finds it particularly hard to cope with city life, and usually spends the first day hiding in the bedroom. 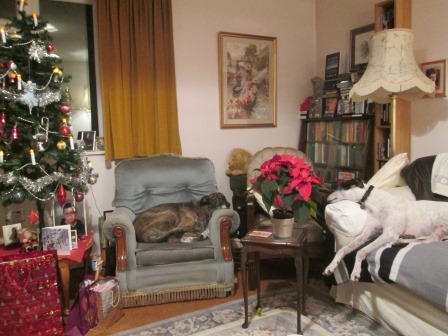 I had to help her get over her culture shock by re-acquainting her with the delights of Granny’s sitting room. The room soon filled up when the rest of the family arrived. They spent most of the time playing with their phones and trying to explain to Annabelle’s mother how they worked. I think this must be some sort of human Christmas ritual, like buying sofas. We dogs prefer bones to phones – though we must admit, sofas have their good points. 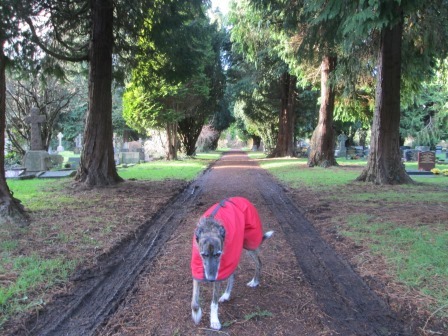 Annabelle’s mother lives in an upstairs flat with no garden, so when we need the loo Annabelle takes us to the nearest grassy place – which happens to be Llandaff Cathedral graveyard. We try not to pee on the actual graves, though. Annabelle says that would be disrespectful, because people like to come and put flowers on them. It’s not a bad place for a walk once you get used to it. 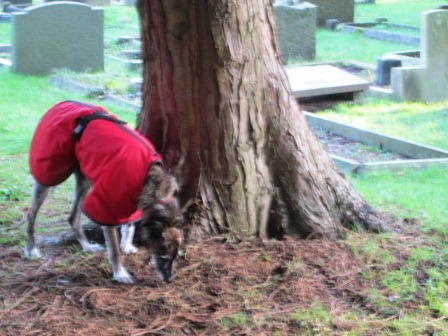 There are loads of squirrels to chase, and it isn’t at all spooky. Not many spirits hang around graveyards once they’ve left their bodies. On the other hand, we often find fairies there. They tend to be the bat-winged type who come out at night wearing crows’ feathers and black eye makeup. 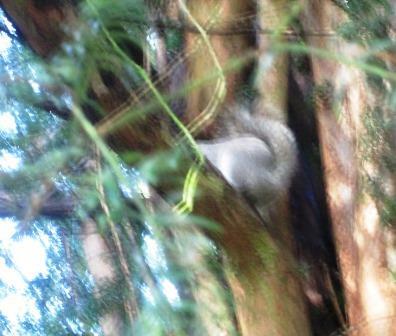 I spotted one sleeping in a tree hollow. …but they were just too quick for us. Pearl called me a loser and claimed she could have caught one easily, there were that many around. As if! 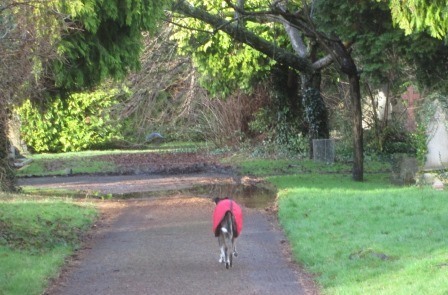 Squirrels would have been the last thing on her mind if Annabelle had let her off the lead – she’d have headed straight back to the safety of Granny’s sofa. Strange to think all this happened last year; it seems like only yesterday. Apparently it’s a completely new year now, so I’ve made some resolutions. I’ve also made some resolutions for Pearl, as she didn’t feel like making her own. Happy New Year, everyone! 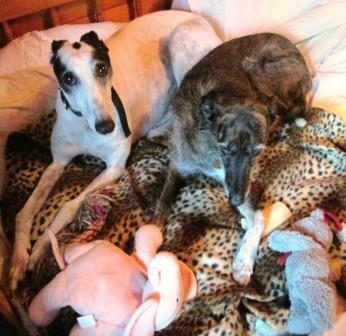 May 2014 be filled with treats, toys and comfy beds. 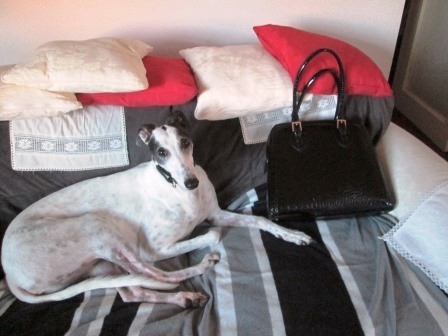 This entry was posted in Millie and tagged animals, Cardiff, Christmas, Dogs, Fairies, Greyhound, Llandaff Cathedral, Lurcher, Pets, Recreation. Bookmark the permalink. 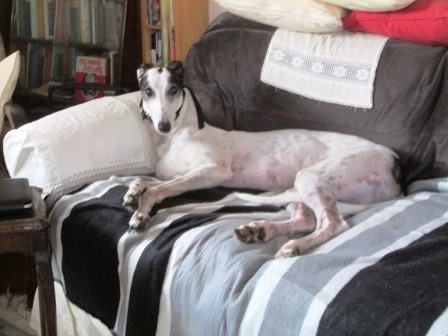 Millie-what a delightful stay you are having-that sofa looks very comfortable too-Happy New Year to you, Annabelle and Miss Pearl-I know Jack Henry, Anna, and Hubble can think of nothing better than a year filled with “treats. toys, and comfy beads”! Our holiday had its high points, but it’s good to be home. 🙂 A very happy New Year to you and your beautiful dogs! 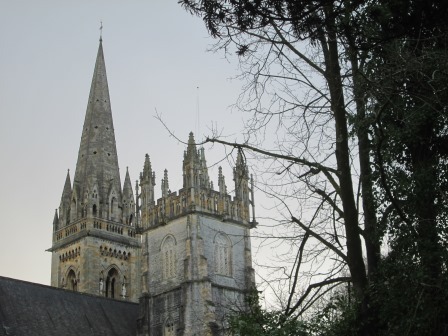 There’s also a famous story called ‘The Town Mouse and the Country Mouse’. We like stories about cats and mice, but we like the real thing even better! Millie, your resolution to not keep your resolutions is spot on. I’m afraid there’s not much hope of Pearl keeping the resolutions I so kindly wrote for her – she wouldn’t even look at them! On a note not connected in the slightest to fox perfume: My Mum came from Cardiff. When she was forced into the countryside she used to hide in the bedroom for the first day, just like Pearl. LOL! My mother doesn’t think much of the country, either. She can’t understand why we want to live here. Such a cute post! I could really hang out in Granny’s sitting room.